An entire section of the United States Sailboat Show in Annapolis, MD, running October 10 -14, is dedicated to chartering, travel and vacations in exotic island locations. “Vacation Basin” is designed to look and feel like paradise, and comprises dozens of charter companies, island tourism boards and options for adventure travel and exotic destination resorts. Attendees will have the opportunity to meet with charter companies from around the world to plan their 2014 excursions, explore fractional ownership, take advantage of discounts for reserving at the show, and win vacation-oriented door prizes. Poseidon Charters, the Mediterranean charter specialists, will be back this year with crewed yachts, bareboats, flotillas and cabin charter programs in Greece and Croatia. They will be offering 10% off their guided cabin charter programs to those who reserve at the show. 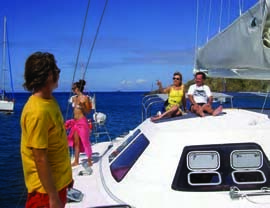 Well-known agents from the Caribbean will introduce visitors to the world of Ship to Shore Crewed Yacht Chartering. Jan Robinson, a St. Thomas resident and author of “Ship to Shore Cookbooks,” will talk about the joys of chartering and great cuisine. Jan, who also represents the Rolex Sailing Regatta, will discuss how to have a “racing vacation.” Ship to Shore knows individual yachts, crews, and itineraries, and are experts in matching a client with a yacht for an amazing vacation. They also represent owners wanting to place their boat in charter. Navtours is a 17 year-old charter company operating out of the Bahamas. They offer bareboat charters, crewed charters and luxury all-inclusive charters on a large range of sailboats and catamarans including the brand new Jeanneau and Lagoon. Vacation Basin visitors will also find Kiriacoulis Mediterranean, the largest yacht charter company in the Mediterranean; BaySail School, located in the quaint waterfront town of Havre de Grace, MD; Dream Yacht Charter, offering more than 500 boats for charter at over 35 locations worldwide; and Annapolis Bay Charters, in operation since 1980. Sail Away Catamarans has the only 100% catamaran charter fleet on the Chesapeake and the BVIs, offering bareboat and crewed charters and offshore sailing instructions. New to Vacation Basin this year are MMk Turizam from Croatia and Cruise Abaco. The Moorings and Sunsail, who each provide powerboat and sailing vacations worldwide offering yacht charters for all level of experience, will also be at the show. For more information about the U.S. Sailboat Show including accommodations, parking and tickets, visit usboat.com or call 410-268-8828.